Posted 3/16/2018 2:44pm by The Webb Family. 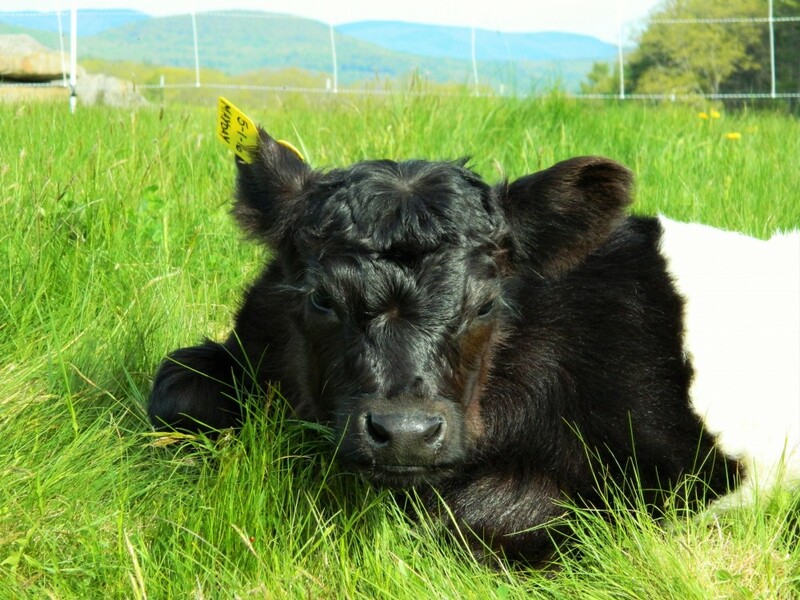 Greetings from all of us at Harding Hill Farm! If you read last week’s update, you know it’s been quite a successful and consistent season so far. It’s pretty rare that we are boiling sap 6 days out of the week so early in the maple season. Our brief taste of spring certainly was too good to be true. The Sunapee region experienced two Nor’Easters in the past week along with several days of scattered snow showers. We now measure the snow in feet and wonder if those February days of 50 and 60 degree weather ever actually happened. As a result, our trees and sap lines are back in their winter dormancy for now. On the positive side, the snow in the woods is quite pretty and the skiers are happy to get those late season powder days. We did have some sap for a Saturday/Sunday boil last weekend. The warmish weather on Sun/Mon also yielded plenty of sap for a late night boil on Monday night. 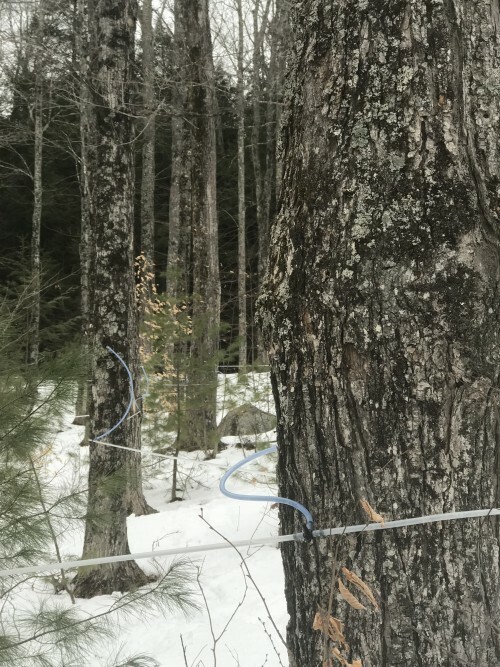 The season total reached just under 327 gallons of maple syrup late Monday, and that syrup was generated from about 18,000 gallons of sap. The winter weather reset also caused drastic changes to our maple grade. For the first time this season, we made a Golden Delicate syrup (about 21 gallons of it!). We rarely make such a light grade, but we only have limited control over what the trees and the weather give us. I’ve had a lot of great questions recently through social media on the maple grading system. When I have a few moments to put thoughts into action and consult the maple expert (Tyler), I’ll share a future blog post on that subject! Looking ahead to the weekend – Join us for some St. Patty’s day fun at the sugarhouse on Saturday, March 17th. The full crew is back in action, and we stored the minimal amount of sap gathered this week so we can make syrup on Saturday. A slow boil will keep the sugarhouse warm and inviting on what looks to be a chilly, March day. Due to the prolonged cold temperatures through the weekend, we will not open on Sunday, March 18th. We are nearly positive there will be no sap leftover, and that makes for a cold, drafty day in the old sugarhouse! Two weeks ago and this week - Isn't this backwards? Maple Weekend is almost here!! Please join us on March 24th and 25th for our annual celebration of New Hampshire Maple Weekend. Visit our Facebook Event page for all the details to share with friends and family. Looking ahead, mark a few of these upcoming dates on your calendar to join us at the sugarhouse! March 17th - Maple Season Continues! 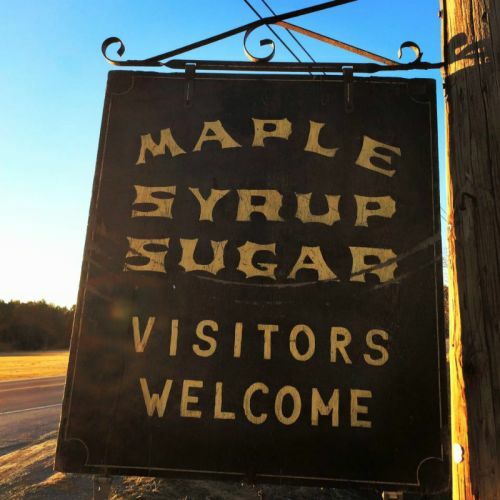 Celebrate the traditional NH Maple Weekend with HHF! Look for more details on Facebook or our website! Stay tuned with my weekly newsletter/blog and Facebook updates for the latest scoop. 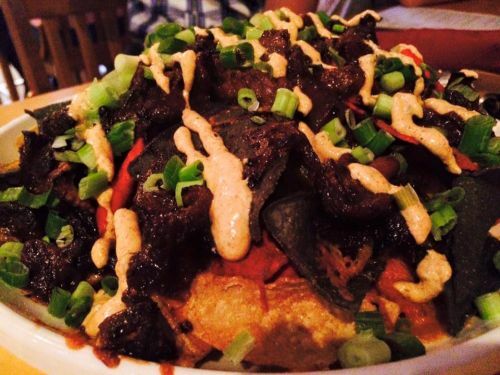 Are you a fan of our Grass Fed Beef? We have a variety of retail cuts available for sugaring season right at the sugarhouse. This includes ground beef, roasts, chorizo (taco-seasoned) sausage, and a limited supply of steaks! If you have a special request or a larger order, contact us ahead of time for a price list and availability. 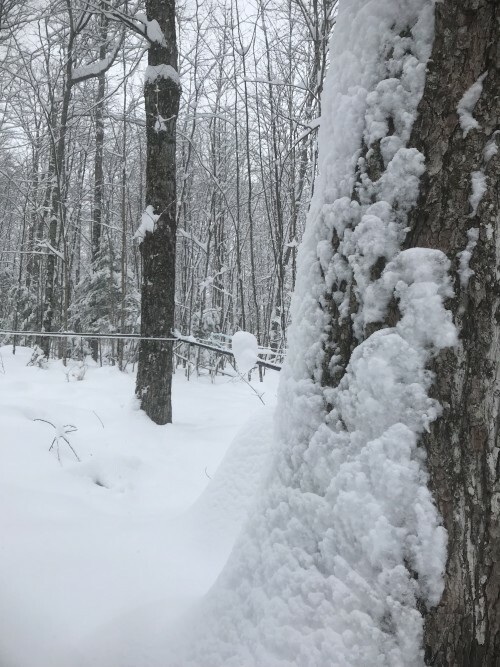 As we dive back into winter conditions here at the farm, the sap run is mostly on hold and Ty and Van are back in the woods for a timber harvest. The snow depth and cold weather is at least good for keeping the impact minimal in the woods. Looking ahead at next week, we may be in for even more snow! Our sources say spring starts soon, but we shall see. Regardless of the weather, our maple weekend celebration will happen next weekend. Stay tuned for my update next week as we prepare for our favorite weekend of the year. Think Spring! As always contact us with any questions, price sheet, or order requests. Posted 3/8/2018 7:50am by The Webb Family. You know its good sugaring weather when I can’t even keep up with my weekly updates! For the sake of time, I’m combining my week 2 and week 3 update. It really is incredible how consistent the weather has been since our first boil on February 19th. Since that first day, there's only been four days where we didn’t fire up the evaporator. Last night we took a moment to just be home and settle in for what appears to be the biggest snowstorm of the season. Spring is only two weeks away... right?! It’s been a tiring season, but we’re making a LOT of syrup. As of Tuesday night, our season total is just over 300 gallons! To put it in perspective, we try to make at least 500 gallons each year. Last year, we finished with 577 gallons. If this weather stays consistent through April, it could be a record season. Keep doing that maple dance… just don’t spill any syrup! Last weekend was our first advertised open sugarhouse. Thanks to all the friends, family, and other visitors that showed up to share in the early season fun! It was a busy Saturday followed by a slower but steady crowd on Sunday. The early season always gives us more quality time to visit with people around the evaporator. We've been making a delicious Dark Robust syrup, and many could attest to how amazing that hot syrup is right out of the canner. Tyler and I also shared some fun news with many of our returning customers… can you figure it out from the picture below? Update for this coming weekend: Due to a family obligation, Tyler and I will not be at the sugarhouse on Saturday. However, we are still open for normal hours. Van and Robin are going to re-live the 1980s and 1990s while keeping the sugarhouse running! There might be a learning curve with our retail sales technology, but they are up to the task. We also recruited Faith to help with IT support just in case. It should be a great day to enjoy the fresh snow either on the slopes or in the woods, but be sure to stop in for an ‘apres’ shot of warm maple syrup. Also of note for this weekend only - grass fed beef is only available on Sunday. Haven’t had time for your annual sugarhouse visit? Don’t worry, there's plenty of sugar season ahead! We plan to be open to the public every weekend in March. Our typical hours are 10am till 4pm on Saturday and 11am till 4pm on Sunday. For the most current updates, be sure to find us on Facebook. Visit Van, Robin, and Faith as they take over operations on Saturday! March 17th & 18th - Maple Season Continues! Look for more details on Facebook! We have a variety of retail cuts available for sugaring season. If you have a special request or a larger order, contact us ahead of time for a price list and availability. We enjoyed the sun earlier this week, but it looks like the snow is back! While we wait out the storm, just keep thinking of that spring warmth as we look ahead to the rest of maple and mud season. Sunny day naptime in the fresh shavings! Posted 2/24/2018 9:04am by The Webb Family. 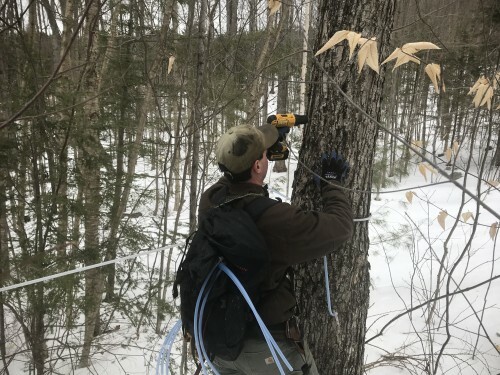 Based on the past couple years, wild weather seems to be the new trend for maple season in the northeast. Back in early February... we spent far too much time looking into the long term forecast. It seemed like a 'traditional' winter was back, and we planned to start tapping around Valentine's Day. It should be a gradual start to the season with plenty of time to get ready. That prediction did not play out as planned! Tyler began tapping on February 13th with two of our part-time employees, Andrew and Brendan. Our maple dog, Acer, helped supervise. Despite the cycles of snow and rain, the woods still require snowshoes to trudge through the 6 to 12 inches of snowpack. It took about a week to get our woods fully tapped, longer than usual, but we installed new drop lines. Drop lines connect the plastic tubing to the tap that goes into the tree. We replace these every four years to ensure good quality sap. We started collecting sap on February 15th, with only a portion of our woods tapped. 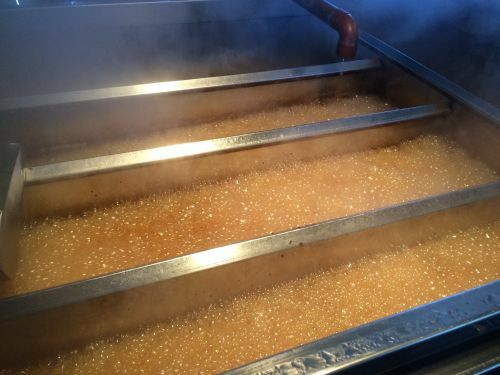 Our first boil of the season was on Monday, February 19th... which happens to be the same start date as last year! We only had enough sap to get the system running smoothly and sweeten the pans on the first night. On February 20th, we made our first batch of 2018 maple syrup, making a total of 23.75 gallons that night. As a fun comparison, we actually made 23.5 gallons on the same day last year! We kept the trend going, boiling Monday through Thursday this past week, and yes we did hit nearly 70 degrees for a daytime high temperature on Wednesday! Luckily, temperatures went back down to the freezing mark that night followed by a couple inches of fresh snow on Thursday. Did I mention wild weather? 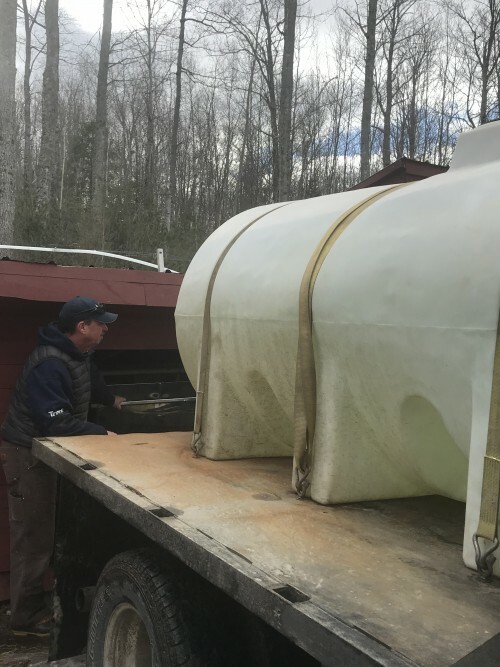 As of Friday morning, we collected a total of 3,825 gallons of sap this season and made just under 63 gallons of a delicious Amber Rich syrup. The sugar content of our sap has been around 1.9% which takes about 46 gallons of sap to make 1 gallon of syrup. The colder temperatures on Friday did not yield much sap, but we do have partially full tanks this morning. We are not officially open this weekend, but check our Facebook page and/or drive by and look for steam. If we are boiling, you're welcome to stop in. With a high of 41 degrees and sun today, the sap is running! Mark your calendar for every weekend in March! We have a variety of retail cuts available for sugaring season. The freezer will be full at the sugarhouse starting on March 3rd! If you have a special request or a larger order, contact us ahead of time for a price list and availability. We hope to see many of you during our maple season. It’s a time of year to celebrate the winter thaw and visit with friends, family and neighbors. Back at the main farm, the cows are pretty excited about the warmer weather too. A winter visitor has fun with our calf, Osceola! Posted 10/16/2017 7:46pm by The Webb Family. This time of year brings many projects to finish before the cold months arrive. Fall also ushers in a fresh supply of HHF meats, and we are looking to clean out the barn freezers. Please join us this weekend for our meat sale and open house! 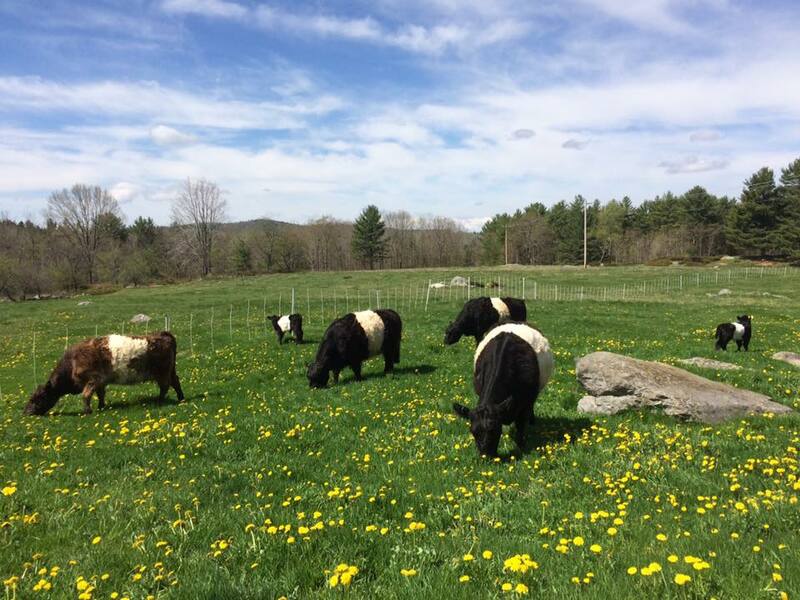 It's also a chance for our many friends and neighbors to visit with the Belted Galloway herd and our pigs too. 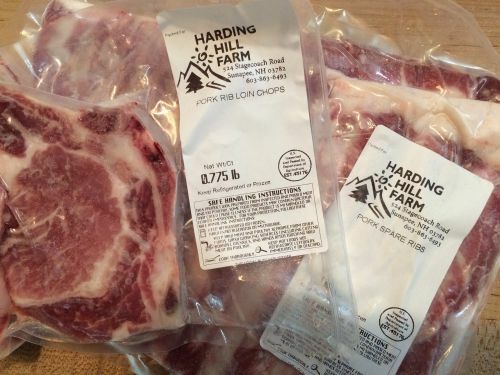 All HHF pork is marked down - limited supply! Only Five Winter Beef Packages available - save 10% off retail! Don't forget about our Maple Syrup! including our signature Lake Sunapee bottle. We certainly hope you can make it this weekend. Stay tuned for more fall updates and the return of our regular monthly newsletters. Posted 7/10/2017 9:27am by Harding Hill Farm. It has been nearly a year since we gathered on the farm and in the woods to bid farewell to 'Pop' (Richard H Webb). We now anticipate another week of homecoming for the extended Webb Family as we say goodbye to an important founder of Harding Hill Farm. Just a short couple weeks ago, we lost our beloved Elizabeth T Webb, affectionately known as 'Gram' or to many others as 'Betsy'. She often provided a place to sit down, take a break, divulge in a sweet treat, and tell her about our adventures. She was our endless support system, always interested in our projects and seemingly crazy ideas. We gather later this week with family and friends to celebrate her life, legacy, and influence on the farm and woods we share with many. Elizabeth Thomas Webb passed away peacefully on June 23, 2017. Born Elizabeth Alden Thomas on October 4, 1920 in Islip, New York, she attended St. Agnes School in Albany and then Katherine Gibbs Secretarial School in New York City. 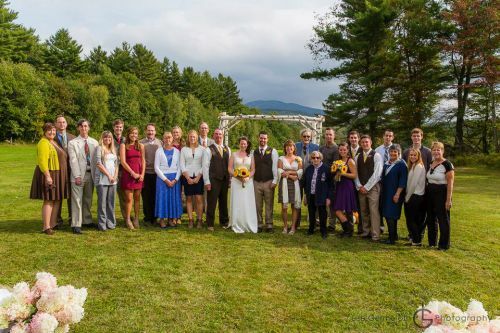 Summers were spent in Thetford, Vermont where she was a counselor at Camp Hanoun. She worked in New York City for several years until meeting and marrying Richard H. Webb in 1951. 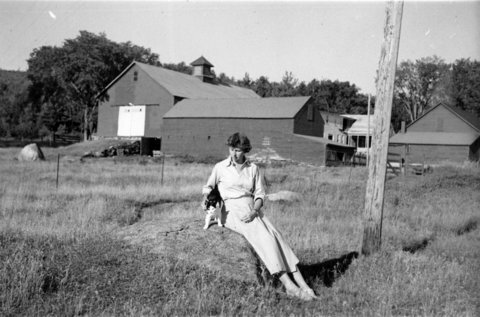 Together they established a home and small farm in Sunapee where she raised 6 children and helped run the farm. Her love of the ocean and spending time with family led to many summers spent camping on Cape Cod or traveling as a fairly large group to other places. They continued to travel for many years, sometimes visiting family and sometimes taking family with them. Upon the birth of their first grandchild they became Grammy and Pops to all who knew them well and they loved watching their grandchildren grow to young adulthood. She was a member of several organizations in the area and was particularly active with the United Methodist Women, the preservation of the Old Town Hall/Harbor House Livery building, and the Sunapee Thrift Store. She is survived by six children and their spouses: Tom and Jackie Webb, Portland, OR; Paul Webb and Lisa Hall, Palm Coast, FL; Brad and Andrea Webb, Hightstown, NJ; Van and Robin Webb, Sunapee, NH; Tom and Faith Reney, Sunapee, NH; Bayard Webb and Lyle Engler, Reno, NV and eleven grandchildren. There will also be a graveside service at the South Cemetery on Harding Hill Road in Sunapee at 1:00 pm. Memorial contributions may be made to the Sunapee Heritage Alliance, PO Box 72, Sunapee, NH 03782. Posted 5/10/2017 9:19am by The Webb Family. I think there might be just one word to describe the weather lately – soggy! It feels as if we entered another climate after nearly a year of drought conditions. The daffodils are flourishing, and my fingers are crossed that the early veggies end up germinating in the farm garden. Meanwhile, Mother Nature has put a stop to most spring activities – with mud, mud and more mud. The rain showers are persistent, with only a few periods of sunshine this past week. Dare I even say we spotted some snow flakes? The grass is green, and with a little sunshine (at some point! ), should take off quickly. We get anxious this time of year to turn the cows out on pasture, but to maintain our fields, it is always wiser to wait for more growth. The cows are tempted too… sticking their head through the fence where they can. The good news is no need to weed whack the corral edges for now. Another sign of spring – the arrival of piglets! For the third year in a row, we are raising a group of piglets on a pasture rotation system at the farm. We struggled this year to find a good source of piglets. Our usual source had small litter sizes, and we’ve been on the hunt for another farm. Luckily, we found them locally, and they arrived last Saturday. 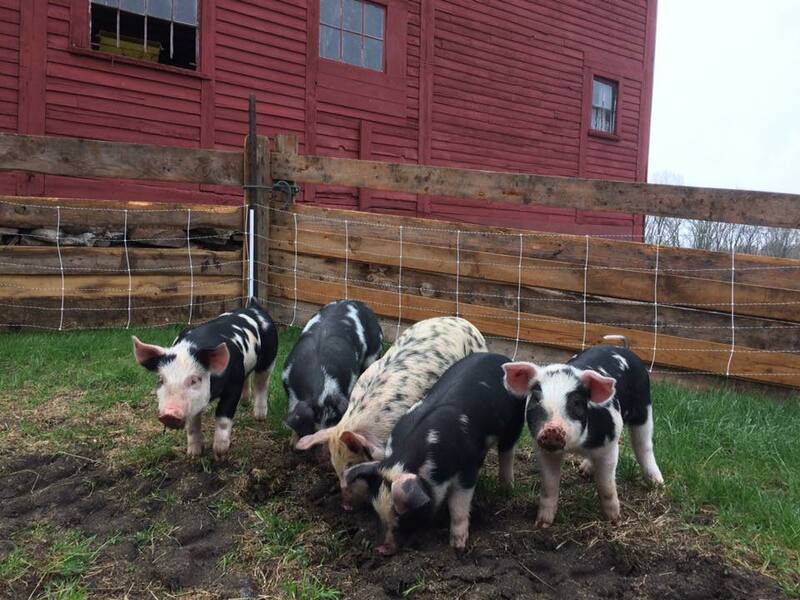 We enjoy raising the heritage breeds, and this year they are a cross between American Spotted and Duroc. 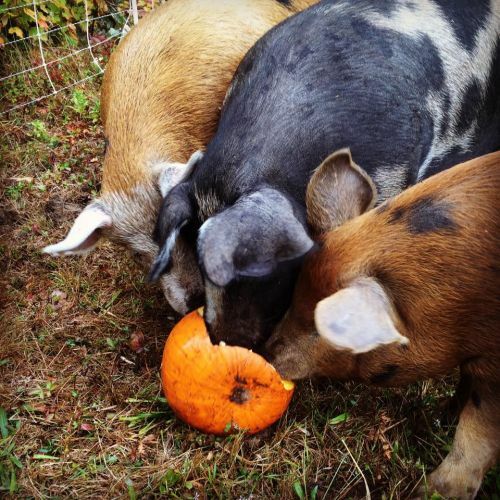 Last year, our pig names came from Snow White and the Seven Dwarves. Everyone has been asking, what will we name them this year? With all those spots, I had to name them after the 101 Dalmations! Considering our lower pig numbers this year, we will not be selling retail cuts in the fall. Our fall bulk pork orders are already sold out as well. Meet Perdita, Pongo, Patch, Lucky, and Rolly Poly. With Van and Robin on another adventure in Europe, Tyler and I have taken over the farmhouse to keep watch on all the critters and streamline things a bit. This past weekend was weaning time for our fall calves. It shouldn’t be too bad we said, considering we left them together far longer than our expected 6 months. Around dinner time on Saturday, all was quiet and the Beltie cows were happily eating their fresh bales of hay. Who were we kidding? About every two hours, I woke up to mooing and more mooing. All I can say is… Van and Robin, you are welcome! And our neighbors, well we’re sorry! Luckily, after a few nights of minimal sleep, all is well in the barnyard and the animals are looking much more relaxed. If you are looking to satisfy your Memorial Day weekend menus, contact us to schedule a meat order pickup. We have a selection of grass fed beef, pasture-raised pork, and maple syrup available for sale. Firewood (green) is available now! Our price this year is $225 per cord, cut and delivered. We will let you know if your location requires a delivery charge. Contact us now to reserve your order. We sell out every year! Spring has arrived in the Sunapee region. Spring tree projects are already underway! Tyler is meeting with clients for consultations and booking 2017 tree services. Email or give us a call to schedule a free consultation and quote. Tyler, a certified arborist, offers tree pruning, removal, cabling, and fertilization. We will be replenishing the supply by mid-May! Interested in purchasing by the cut? 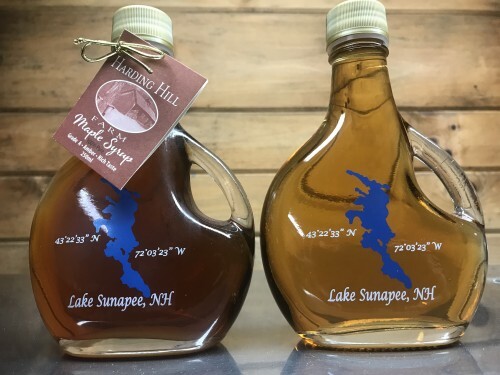 Contact us for the latest availability and prices, and we arrange a convenient time for you to pick up your order at our farm on Stagecoach Road in Sunapee. Currently we have plenty of ground beef, sausage, and a limited selection of steaks and other cuts. For our bulk beef buyers - I will be contacting our repeat customers this week. Please let us know if you are interested in a half or whole cow in 2017 or beyond. We are hoping to see more green in our pastures after this rain is done! Signs of spring keep appearing on the farm with asparagus starting to peak out above the soil. Peas, spinach, and other greens are started in the garden, and Robins flowers are off to a great start indoors. Happy Spring! Posted 4/19/2017 7:40pm by The Webb Family. Well folks, it’s been another successful season… and a long one! We tapped our maple trees at the traditional time in mid-February. The remainder of the 2017 maple season was far from traditional. We made more syrup in the month of February than any other season in our 50+ year record at 172.5 gallons. March came in like a lion, bringing back mid-winter conditions and temperatures below freezing. Our retail weekends were challenging to start the typical maple month with the subzero weather. With frozen pipes and lack of sap, we adapted our typical open house times. For the NH Maple Weekend celebration, temperatures moderated slightly but it snowed, sleeted, rained… something fell from the sky! Van and Robin even joined us to keep production running smoothly and assure visitors had a warm shot of syrup and a maple cookie as they headed out the door. Also, Brendan was working hard to keep the evaporator running so Tyler could spend time giving tours. Shortly after maple weekend, we were in for another change. The April Fool’s day snow storm dropped at least 16 inches of snow on the farm. 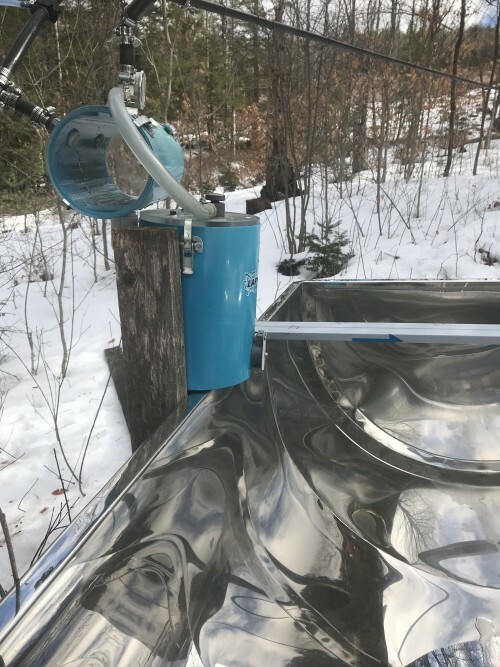 It even fooled us as we fumbled to put the plow back on the sap truck, get the sugarhouse cleared out, and operate on somewhat of a normal maple schedule. 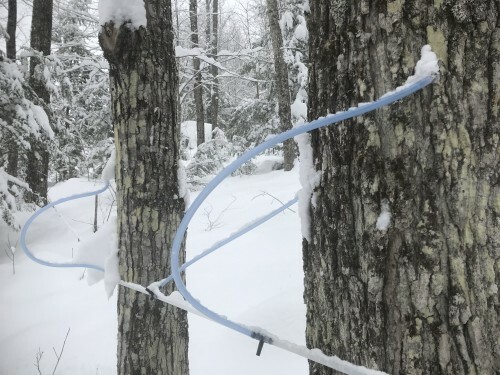 The following week, as if Mother Nature flipped a switch, sugaring went into high gear as temperatures warmed and the sap flowed. In the 12 days of April before the season ended, we made 223.5 gallons of maple syrup which is 39% of our crop. Surely that explains why it took me a week to pull myself together enough to write this wrap up! The biggest surprise of all this season: our incredible local community – customers, friends, and family. Despite the weather challenges, you visited the sights and smells of the HHF sugarhouse, and we had our annual chat around the evaporator. Tyler and I were fortunate enough to get a couple of spring skiing days in right after the season wrapped up – nothing like some sunny, slushy moguls to recharge the spirit! This week, we are pulling taps, rinsing lines, and preparing the maple trees for a long rest. Now we transition to winter cleanup and spring projects – such as spreading manure with a view! Once we finish up sugaring, we start delivery of firewood orders. Get your 2017 order in now! For 14" to 24" length green firewood, the 2017 price is $225 per cord. If you are interested, contact us with your name and address to get on the list. We will let you know ahead of time if your location requires an added delivery charge. Spring has arrived in the Sunapee region. It's the time of year for spring clean up, including tree care! Tyler is now meeting with clients for consultations and booking 2017 tree services. If you have some trees that may need to be looked at, contact us to schedule a free consultation and quote. 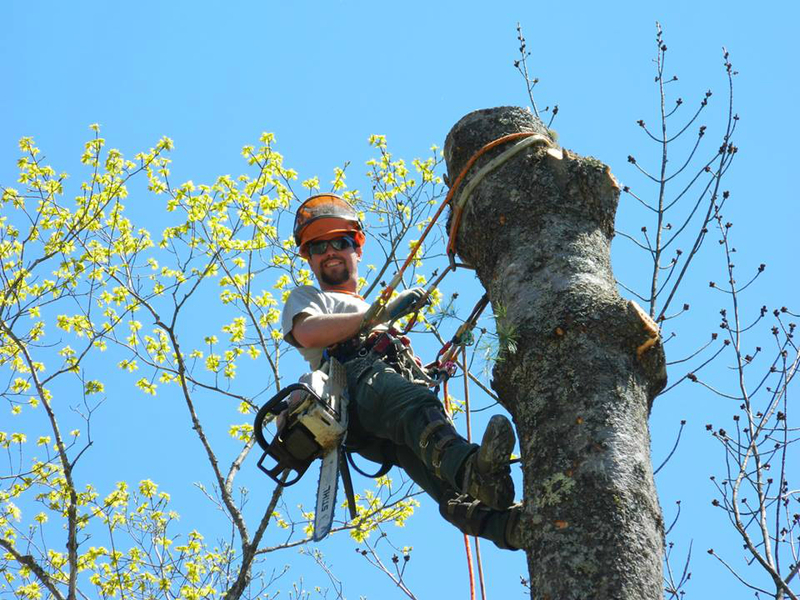 Tyler is a certified arborist offering tree pruning, removal, cabling, and fertilization. Are you or someone you know looking for lodging in the Lake Sunapee region this spring/summer? We have a rental home on our farm - a great place to get away with the whole family! The Lake Sunapee region has a lot to offer in the summer with nearby lakes, beaches, hiking, biking, and much more! We certainly hope this home continues to be a great gathering place for many families and friends. 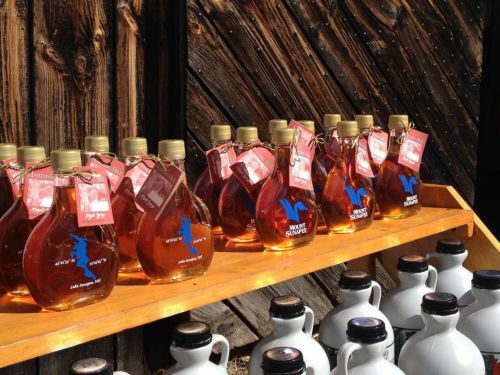 Still need to stock up on maple syrup? Maybe some local beef or pork? Don't worry! You can contact us directly any time of year to place an order for pick up at the farm. You can also find our syrup on the shelves at several local retailers. As always contact us with any questions, price sheets, or order requests. Posted 4/6/2017 8:10pm by The Webb Family. 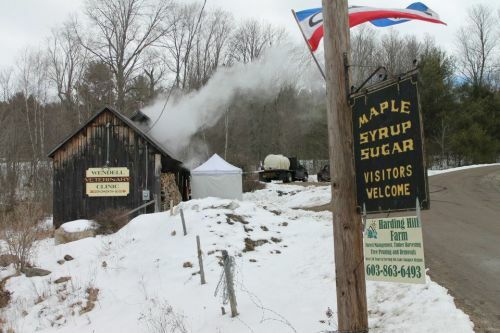 The maple season at Harding Hill Farm went into high gear this week! The April Fool’s snowstorm kicked off what has been the best week of sap runs this season. Our sugarbush produced all night Saturday after the storm. The only down side – we did not shovel the 16 inches of wet, heavy snow that was sitting on our sap house roof. It was an early morning for us on Sunday when our live web cam indicated that all the main line connections to our releaser and sap tank were busted. After a couple hours of fixes and laughs, we were back up and running Sunday. There’s no crying over spilled sap I guess! Sunday and Monday were beautiful days for a sap run – 40s and 50s with a 20 degree low over night. Over those two days, we collected over 3,700 gallons of sap and produced 79.5 gallons of maple syrup. On Monday alone, we hit a daily high for the season at just over 50 gallons. We are also surprised by the consistency of our maple grades this week. We produced a nearly identical shade of Dark Robust for 5 days in a row. After a momentary break on Wednesday night, we are easily working toward a 30 gallon total tonight as I write this. I’m enjoying the sweet steam by the evaporator for inspiration tonight, and maybe a few samples too. I also had a bit of blogging/facebooking assistance from a friend. Many of you have asked what our typical syrup goal is each season, well it’s 500 gallons and we are hitting the mark tonight! Will we compete with last season’s record total of 575 gallons? We shall see. This is when we really start checking the weather constantly. Our weather pattern is in for quite the change in the next week. New Hampshire is in the thick of mud season and our second day of heavy rain. Mother Nature is also starting to take away our below freezing nights – only Friday and Saturday night are expected to go below freezing. The forecast shows temperatures reaching possibly into the 70s next week, so the trees will break bud soon. Let’s hope for sunny skies over the weekend! 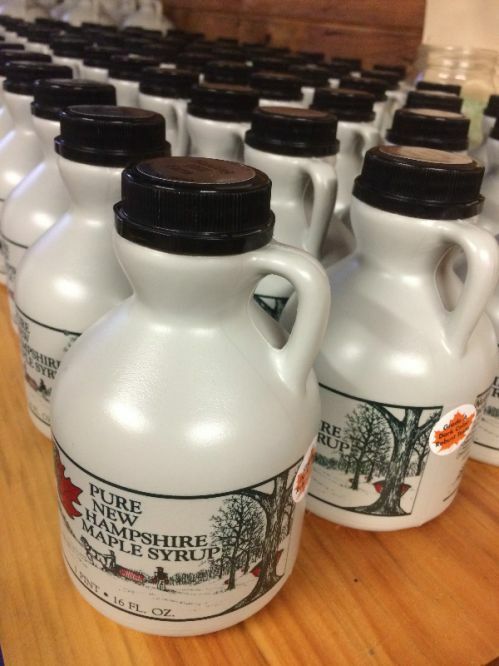 We finished up the last official open house of NH Maple Month on April 2nd. For the upcoming weekend, we expect to have sap for a Saturday afternoon boil. If we are boiling, doors are open for visitors and sales. Check in with us on Facebook, by phone, or just drive by for the most current update on sap and boiling times. *Don't forget - Our sugarhouse is located at 131 Route 103 in Sunapee just below the Wendell Vet Clinic. Make sure you do not follow our farm address to Stagecoach Road. 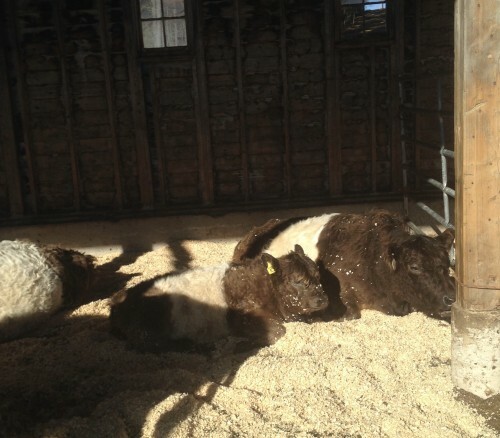 Good news from the Beltie (Belted Galloway Cattle) world! We have six momma cows confirmed pregnant. We are expecting calves July 30th through Oct 5th, and we couldn’t be more excited. Hopefully, we find time to plan a fall open house and welcome visitors to say hello to the new additions. Mud season is always especially tough on the cows. The wild weather this season has meant more work for farmers and wetter conditions for the critters. After 16+ inches of snow, we have had to adjust and bring in clean sawdust because comfortable cows make delicious meat. April showers make us dream of greener pastures! As sugaring season wraps up, we start to work on firewood orders. Get your 2017 order in now! For 14" to 24" length green firewood, the 2017 price is $225 per cord. If you are interested, contact us with your name and address to get on the list. We will let you know ahead of time if your location requires an added delivery charge. I will send out a final wrap up of the maple season next week. Be sure to stop by if you see steam at the sugarhouse over the weekend. A big thank you to all of the family, friends, and customers that make this the 'sweetest' time of year! Posted 3/31/2017 2:45pm by Harding Hill Farm. We love our customers, and its apparent that our customers love maple! We had an excellent turnout for maple weekend, despite the snow/sleet/rain that Mother Nature gave us. The sap run was less than ideal, and yes we did boil water to keep up the ambience. Surprisingly enough, Tyler did have a voice after giving two days of tours. Van and Robin helped out with samples and sales while catching up with friends. My maple cookies were a big hit - we handed out 18 dozen of them over the weekend. Quite a few people also went home and made their own - see below! As we've said before, the weather has been challenging to say the least this season. On monday, the Sunapee region received about a quarter inch of ice which luckily didn't cause much damage. The weather warmed up going into mid-week, creating good sap conditions. The sap was slow to run on Tuesday, but it was quite sweet at 3% sugar. On Wednesday, the trees cooperated, and we collected 1200 gallons of sap. We made a Dark to Very Dark syrup last week, and the grade bounced back to almost an Amber Rich. The syrup count climbed to a season total of 354 gallons. The conditions on Thursday were perfect for sugaring - classic blue sky, sunny, and a high temperature at 43 degrees. 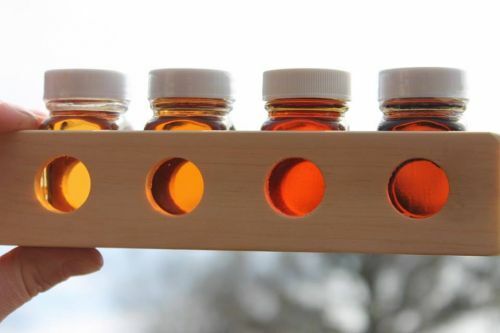 Just a reminder - the best sap runs happen with warm, sunny above freezing days with below freezing nights. The sap measured at 2% sugar (40 gallons to 1 gallon syrup), and we have plenty of sap ready for the weekend. Once again, the weather has changed. As I write this, I am sitting by the wood stove and watching the snow fall. We expect around a foot of the white stuff into Saturday morning. Surprisingly enough, the sap is still running right now! Once every couple years, we get a low pressure snow storm that causes the sap to run even with below freezing temperatures. Sugar-makers refer to this as 'sugar snow', although in this case, temperatures are a bit cooler with a slower sap flow than a true 'sugar snow' event. Given the current weather situation, we plan to open late on Saturday. That will give our customers and ourselves a bit more time to dig out from the storm. We'll start up a good boil around 1pm on Saturday and should finish up around 4 or 5pm. Sunday is forecasted to be warmer and sunnier, so we will be open our normal hours. Be sure to stop by - this is our last scheduled Open Sugar House of the season! We still have plenty of dark, robust syrup and maple cream. Our freezers are stocked with grass fed beef and pasture-raised pork! Email us for any large orders. Next week, I promise to write about our latest happenings with the cows as we look forward to greener pastures! As soon as the sugaring season comes to an end, we begin delivering firewood to homeowners in the Sunapee Region. We make up to 200 cords of firewood each year, and it often sells out by early summer. For 14" to 24" length green firewood, the 2017 price is $225 per cord. If you are interested, contact us with your name and address to get on the list. We will let you know ahead of time if your location requires an added delivery charge. Spring is around the corner, so don't miss the sweet smells of the sugarhouse while it lasts. Be sure to stock up on your maple supply too - visit our recipes page for more ideas on how to cook with maple! Posted 3/24/2017 3:48pm by The Webb Family. It's all hands on deck as we get ready for the annual New Hampshire Maple Weekend open house. 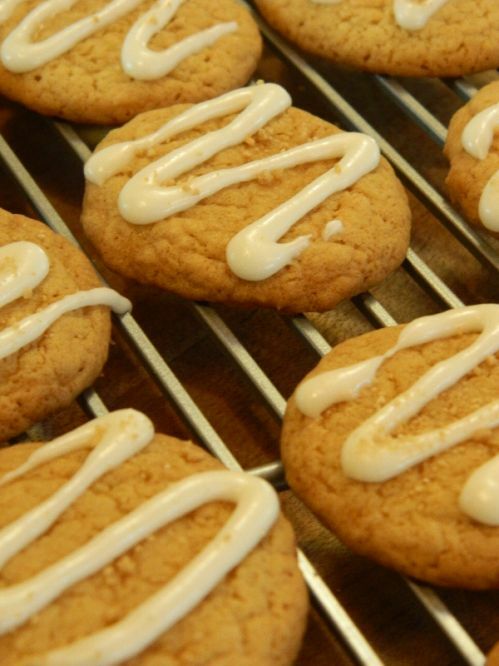 As I write, I have several batches of maple cookies baking away in the HHF kitchen! The maple season over the last two weeks has been challenging to say the least. We opened last weekend on Sunday only, with limited sap. The good news is we have made about 300 gallons of maple syrup so far this season... so plenty of the fresh stuff available for all. On our 'day off' last Saturday, we traveled to a beautiful piece of family property in Wilmot to take a snowshoe on a portion of the Sunapee-Ragged-Kearsarge Greenway. A gorgeous day to enjoy the outdoors surrounded by maple trees. The evaporator room will be dry and warm! Don't miss Tyler's fun and informative tours. There's plenty of Amber Rich and Dark Robust maple syrup on hand to purchase. We also have a supply of Maple Cream, Candy, and Sugar. 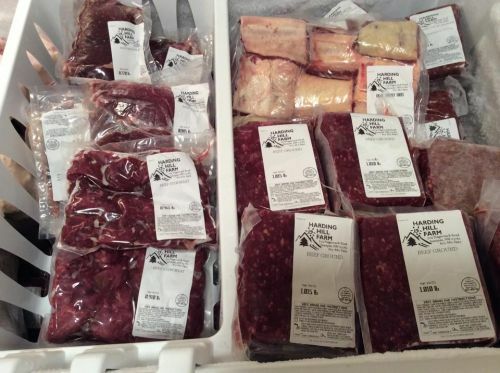 Our freezers are stocked with grass fed beef and pasture-raised pork, be sure to try the samples too! Check out the Facebook Event and please share with your friends. *Don't forget - Our sugarhouse is located at 131 Route 103 in Sunapee just below the Wendell Vet Clinic. Make sure you do not follow our farm address to Stagecoach Road. Harding Hill Farm was in the Spotlight! If you didn't see via our Facebook page, I took over Dairy Carrie's page for a day to talk about the farm and maple. Carrie is a blogger/speaker/dairy farmer from Wisconsin and an incredible advocate for all forms of Agriculture. At one point, I had over 16,000 views on one post! That is quite impressive for a little farm in Sunapee. I featured our oreo cows, sugaring from sap to syrup, and Ty's tree services. It was super fun, and a few of the videos are featured on our page. Please remember to join us this weekend for a celebration of all things maple! 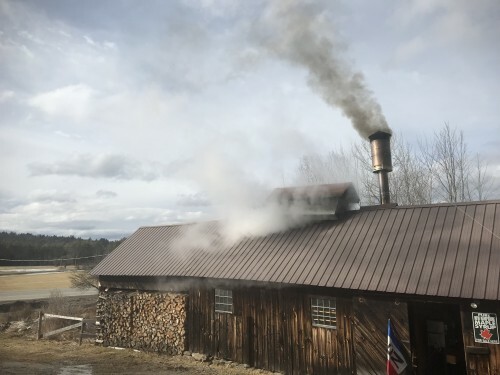 Spring is around the corner, so don't miss the sweet smells of the sugarhouse.